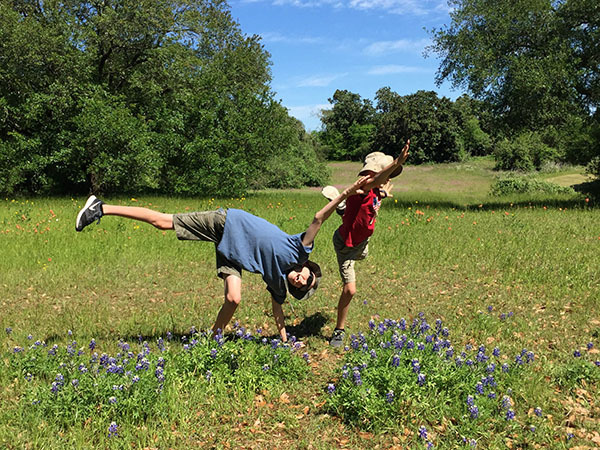 We Texans are passionate about our state flower; the absolutely gorgeous, stunning, and probably most likely world-renowned bluebonnet. 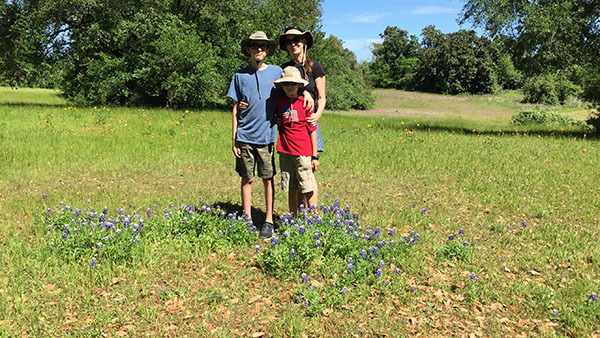 In order to keep your Texas citizenship you must make the annual drive to Bluebonnet Country and stick your kids, pets, spouse, parents, or friends in a field of bluebonnets most probably also full of poisonous snakes and fire ants. And of course, the photos are always best taken during hot sunny days with your poor victim staring directly at the sun while getting bite and stung and sunburned. 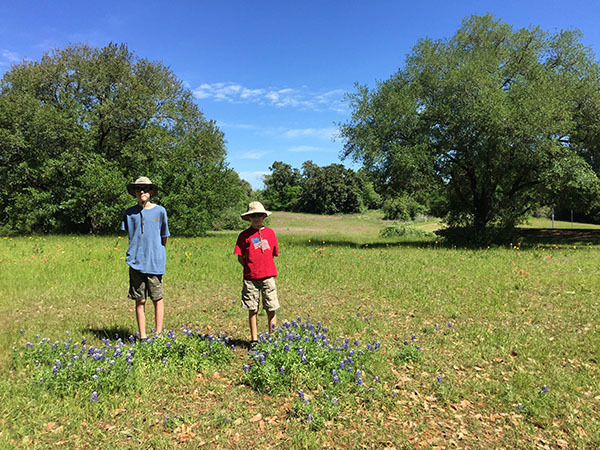 This year we had an early spring that started in January, so by the time we did our annual bluebonnet drive (yesterday) with my mom, the bluebonnets were already past their prime. 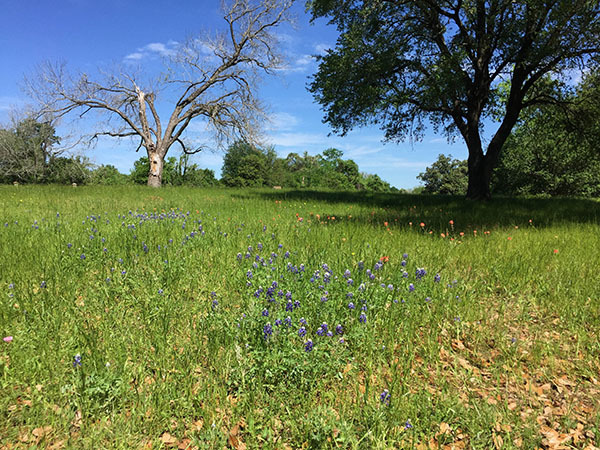 Here is a photo of a glorious field of bluebonnets. 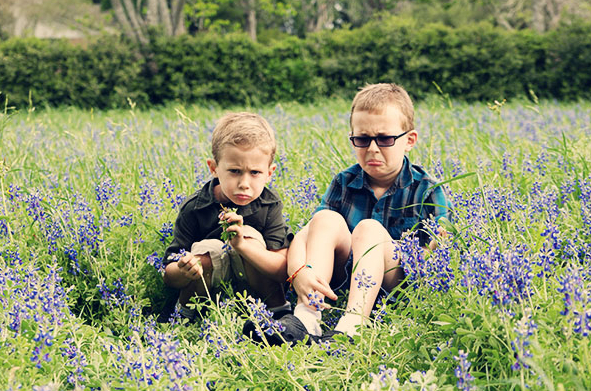 But we are troopers and I was going to get my annual bluebonnet portrait of my boys. 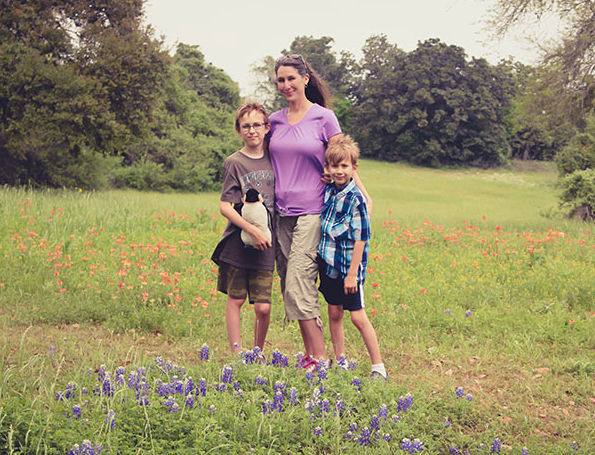 Mom took a quick snapshot of me with the boys in a lovely field of bluebonnets at Washington-on-the Brazos. We forgot to take off our hats. And why is this photo so long and skinny? My mom has an iPhone exactly the same as mine, yet when she uses mine to take a photo she always does something weird to the camera app. It is like she has never touched an iPhone camera before. The first "photo" she took of us was a long video of me ordering the boys to position while sucking in my gut, lifting my chin, and turning my body to the side then asking my mom why she was staring at the iPhone in confusion and then yelling at her that she was taking a movie AGAIN. My poor mom. She really raised a rotten daughter. I had not realized how big the kids were getting until I looked at this photo from exactly 2 years ago. Duke, who is 12, is almost as tall as me now! 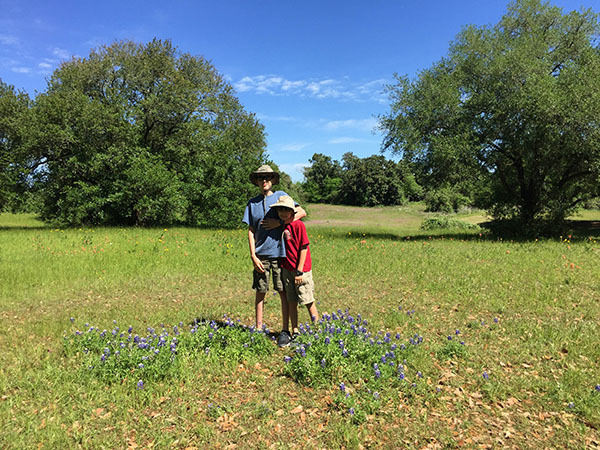 Well, now I have my photo with the boys and it is time to get one of those gorgeous bluebonnet photos of my kid. This will be a breeze because I am a photographer and have been doing this for years. Hey kids, can you get a little closer and act like you actually like each other? Duke, please don't strangle your brother. And you guys are too close now. Duke, you can nicely ask Imp to move, you don't have to hit him! Seriously, will you stop kicking your brother! 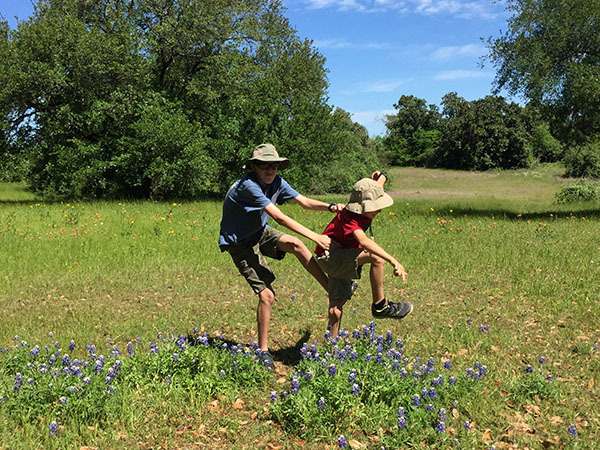 And don't step on the bluebonnets, they have a sign saying you can't touch them!!! 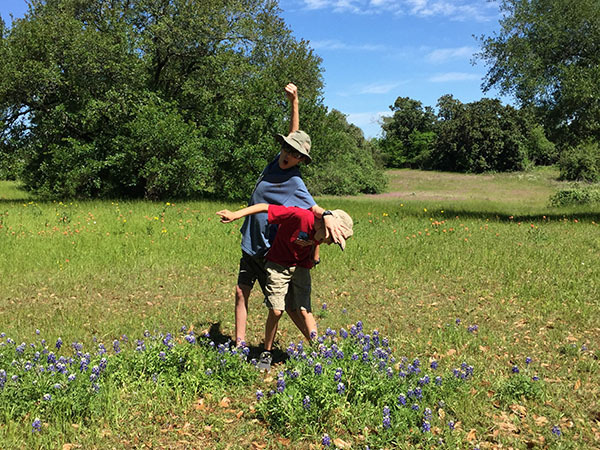 I remember the days when my kids were young and I would dress them up and sit them in a field of bluebonnets and they would look like gorgeous little angels. Yes, those were the days. I hope everyone has a wonderful weekend!!! OMG. The looks on their faces when they were little. That is just too priceless. Thanks for the smile and have a great weekend ahead! My kids crack me up! You have a great weekend too Lisa!!! I think that is probably most boys! But at least they always make us smile.